Model T Ford Forum: What kind of carb is this #2? What kind of carb is this #2? Model T Ford Forum: Forum 2014: What kind of carb is this #2? Here is another photo of what the components look like. Thanks Steve. I have additional posting on the What kind of carb is this? I had to post two separate things to get the photos downloaded. Okay. I have a couple questions about these. For one thing, how good are they? I have a really nice early one (patent pending) that I have fixed up to maybe use on my '15 runabout. If I ever get it put together. Also, does anyone have many parts for these? That early one appeared to be a near NOS body only. I had recently gotten a nice slightly later one with the 1915 patent date on it, and robbed everything from it to make the earlier one complete. I would like to get all the pieces to make it complete and usable again. 45 years playing around with these things, and those are the only L-2 carburetors I have ever had. i don't know how good they are personally. This is the best looking carb out of 5 I bought at a honey hole close to me here. I have a brass holley on my 1914 and it does really well, No problems so far. Hopefully someone else can answer that, I am still a novice. Maybe put the question out there on a new thread? Thanks for the question Wayne. Under that hex nut on top is a cork bumper, that is the stop for the air control flap. The L-2's is kind of stubby compared to the L-4's. Never leave that flap out if you rebuild it, it won't run for nothing if you do. It's strange though to see a L-4 float in an L-2 they were usually cork. As I understand it the L-4 runs better than the L-2 and an Holley NH works better still. This may or may not be true never tried the Holley. I prefer my brass bodied L-4. You know there is something strange about this carb...it's an L-2 by looking at that top nut, but the bowl nut and the length of the body suggests it's really an L-4. L-2's are really stubby looking compared to the L-4. If any of the internal parts look like any of these (particularly the air control flap just behind the throttle plate), that's an L-4 with the wrong name plate on it. Martin, thanks for the comments. 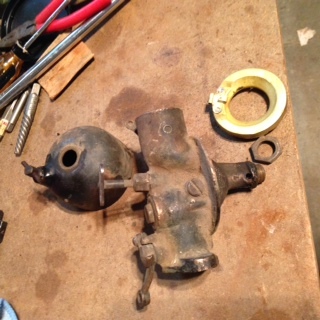 There are a couple more photos of this carb on my other thread called What kind of carb is this? Maybe the other photos will help confirm what it is. It appears to me that someone has rebuilt this carb over the years because it had the hex shaped Grose jet in it. I have taken it out at the advice of others and am looking for the straight needle and jet. 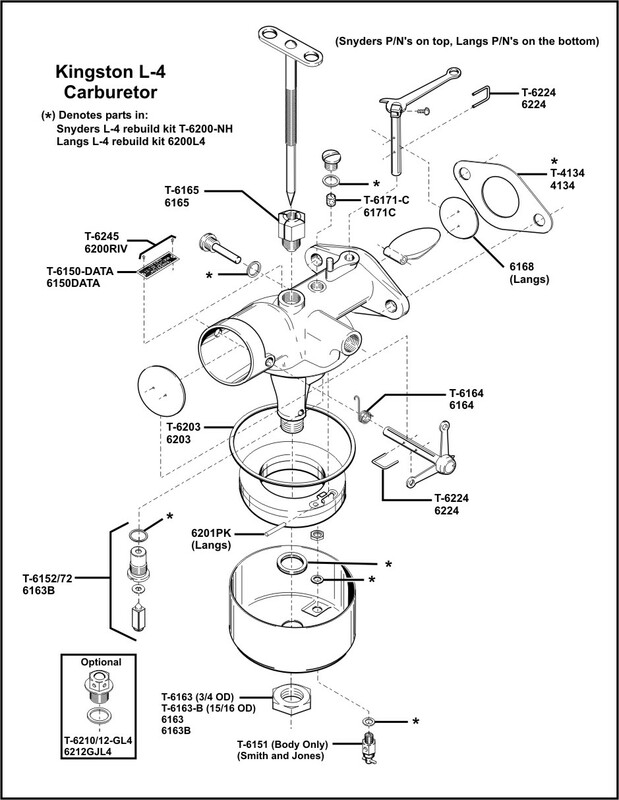 The cover cap at the top of the carb looks different than the parts illustration you sent (which is really great!). The other thing I am not sure of is whether the needle and seat for the L4 will fit the L2? The main difference between the L-2 and the L-4 is the bodies length. The bowl nut on an L-2 is 7/8 and the L-4 is 5/16. Mine is a brass bodied L-4 and the one in your picture looks very much like mine. The typical L-2 is really stubby looking carburetor compared to the L-4. Good idea to dump the gross jet, they only work if you're planing on running a fuel pump, I tried one once and regretted it and went right back to the needle and have never had another problem.